A primer on new world order, redflagging and custom card design. This is a primer on New World Order and Red Flagging to help inform magic players and custom card creators what these concepts are and how to apply them. My aim is to make this guide necessary reading for any custom card creator designing commons in a custom set. This guide may still be a little rough so feel free to ask questions, give suggestions or point out any errors. New World Order (commonly abbreviated to NWO) is a concept used by Wizard of the Coast when designing commons to limit complexity at common. NWO is the brain child of lead designer Mark Rosewater and was first introduced in this article from December 2011. NWO's aim is to lower the barrier of entry of Magic and make magic more fun by introducing clarity to a blocks design while decreasing comprehension and board complexity that can lead to unsatisfying gameplay experiences. New World Order was first implemented partially in Shards of Alara block with Zendikar being the first block fully designed with NWO in mind. NWO and red flagging is potentially crucial if you plan on making custom magic card sets as keeping a lower complexity level at common will create better gameplay and allow you to focus the complexity on what you want to showcase in your set. Q: So how do you actually apply NWO? A: NWO is applied through the use of Redflagging common rarity cards that have an increased complexity by following certain rules and then making sure the total number of red flagged cards are less than 20% of your total commons. Red flagging is used to mark that a common card is breaking NWO complexity in some way so that the designer can make sure that the card is adding to the focus of the set and thus adding unnecessary complexity. A common card is red flagged if it breaks one or more of the follow rules that I'll go into more detail about shortly. Cards that break more than one of these rules must come under intense scrutiny and most likely moved up to uncommon in all but the most aberrant of cases. Any card that you keep in your set that is red flagged must make an important contribution to the set's theme or limited environment. Does it affect other permanents? Does it have four or more lines of rules text? Does it need to be read twice? Does it create card advantage? Does it have the potential to kill multiple card at once? Can it create a loop? Does it use complex magic terminology. Ok so now that you've wrapped your head around what the basics of NWO and red flagging are let look in detail at each of the red flag rules and how to apply them. 1) Does it affect other permanents? It is the most important red flag for reducing board complexity that can be extremely hard for newer (or even experienced) players to parse effectively to make decision about what they want to do. In essence if there is too many things going on in the board state it becomes to hard and you end up making mistakes which doesn't lead to fun gameplay. Kithkin Shielddare is a common from Shadowmoor before NWO way implemented and the set was known for its confusing board states with extremely high board complexity. This is remarked upon in that year's State of Design article as being a mistake made in the set. So then what is wrong here about Kithkin Shielddare and how exactly is it adding to complexity? Whenever I attack a player who has Kithkin Shielddare I suddenly have to do a lot more combat math to figure other if the available blocks/trades are going to be worth it. Now this by itself is fine but because this card is common what happens if I had 2 or 3 of these? Suddenly you can see how while a single Kithkin Shielddare may be able to be calculated around (And this isn't even true for new players) a board state with 2 or 3 Kithkin Shielddare's is simply too much for our brain to handle which is a bad thing for your limited environment. Now this looks like another example of a simple common that breaks this rule right? Tappers don't activate this red flag. This is because they have to be used before combat and thus actually simplify the board complexity by making less choices in attacker or blockers. This can then apply to any sorcery speed activated ability or an ability that doesn't effect the board state such as Voyaging Satyr. Ok one last example that tripped me up initially when applying Red Flagging to the commons of my custom set Dreamscape of Noctus. Now originally I saw cards like Crackling Triton in Theros and thought to myself that wizards must of decided that because the sacrifice creates card parity this effect wouldn't get red flagged under NWO. What it didn't realize was that was irrelevant and that instead the additional board complexity it added was what mattered irrespective of what power level the effect was. This also shows us dangerous assumptions we can make about precedent based on WOTC products as I assumed Crackling Triton wasn't red flagged when in fact I later confirmed it was. Remember that NWO says we can have 20% of our commons red flagged but they should each make an important contribution to the set's theme or limited environment. Triggered abilities that only effect itself are not red flagged, this means that a card like Steppe Lynx or Midnight Guard that is triggered by other cards but that trigger only effects itself are fine at common. But remember that this effect is slightly more complex that normal as players can forget them. Thus if you have these type of triggers be consistent among a subset of commons it can reduce the overall complexity. If you are not using cohesive triggers for triggered abilities then some of your commons may fall under Red Flagging. One last example is to show that cards don't need to have the word target on them to be red flagged under this rule. Selfless Cathar in an example of a card that if a player forgets about it can lead to extremely bad situations. While it doesn't have the word "target" on it, it can still mess with the board state via its sacrifice ability. You may notice that this was a common in a core set (which try to reduce the common complexity even more than normal) but it was a role player in the white weenies limited archetype and thus WOTC felt it was worth having as part of their 20% allowance. Finally be aware that instants and sorceries that target creatures don't fall into this category as they stay in your hand and are thus hidden information that isn't taken into account for board complexity. 2) Does it have four or more lines of rules text? Does the card have four or more lines of non-reminder, non-flavor text. This is by far the most common red flag, often making up for 75%+ of the total red flags in a set. Its also the red flag with the most leeway and that is most acceptable. Having a dozen wordy cards is going to happen to every set, but thats far better than having ridiculous board complexity due to having a dozen Samite Healer style cards. It is important that when a player looks at the cards on the board and in his or her hand that they are able to understand them quickly and without getting confused. This is particularly important for younger players who may not be as strong at reading. So this red flag allows us to maintain a coherent and easily accessible game. reducing comprehension complexity and thus meaning your players can focus on the fun gameplay complexity. Even if we assumed that all players of our set have strong reading abilities (a dangerous assumption) this restriction on wordiness prevents designers from creating cards that are mechanically too complex as we have to work within an extremely limited word limit. The reason this only looks at lines of rules text is that a mechanics rules text only needs to read once or twice when learning that mechanic and can then be skipped while still knowing the functionality of the card. However this card doesn't actually fall under the red flag because nearly all of the card's text is reminder text that can be quickly mentally shortcutted by a player who knows what regenerate and deathtouch actually do. Be aware that red flagging doesn't take into consideration Average Words per Common which is still something to be aware of if you have lots of long reminder texts for your commons but that falls outside of the scope of this primer. Kinscaer Harpoonist as you can see has 4 lines of rules text and thus falls under the red flag here. However I've had designers try and argue that the flying text can be ignored due to being an evergreen mechanic. This however is not the case as the mechanic still contributes to what you have to think about when you read the card. Even if you know the mechanic, while your brain shortcut what flying means it is easy to will on a wordy card. How many times has the situation come up where your or an opponent forget that a certain creature has flying or first strike or other relevant evergreen keyword? One line of text that you can ignore when looking at word count is the enchant creature line on auras as this is considered part of learning the aura subtype except when given weird enchantment clauses that may fall off under certain conditions like Runner's Bane. Ability words are the single greatest source of confusion and questions about the wordyness redflag so I'm going to expand on this a little more than in previous version of this primer. An ability word is a word that thematically groups cards with a common functionality, but has no special meaning in the Comprehensive Rules. Examples include Battalion (Wojek Halberdiers) Landfall (Plated Geopede) or Converge (Brilliant Spectrum). Nearly every ability word has some sort of text that is repeated across all cards that use that ability. For example nearly every landfall card has the "Whenever a land enters the battlefield under your control." For the purposes of red flagging via the number of lines of text, this repeated ability word text is ignored and treated like reminder text. Thus a card like Plated Geopede that looks like it contains 4 lines of text and thus would normally be red flagged actually only contains 3 lines and isn't red falgged once you disregard the generic landfall text. The reason this is allowed is because of mental shortcutting. Applying a term to a specific ability means that we can gloss over the text and immediety look at what exactly the effect is without having to relearn what the card is caring about mechanically. Finally it is worth mentioning that sometimes you get "invisible mechanics" which are basically ability words with repeated text that don't have the italicized ability word text for whatever reason. Some examples of these are Eldrazi spawn/scions from ROE or BFZ, the Naya "5 power or greater" mechanic from Shards of Alara or the Processors from BFZ. Basically if you asked most players what some of the mechanics of the set where, they will include these despite not having an associated ability word. So when it comes to NWO Red Flagging we treat the repeated text of an "invisible mechanic" as exactly like as if it had an ability word, thus ignoring the repeated text. 3) Does it need to be read twice? Is this card hard to parse or understand due to mechanical complexity or weird wording? This is one of the rarer and more intuitive red flagging rules that looks at if players have the ability to work out quickly what the card does. 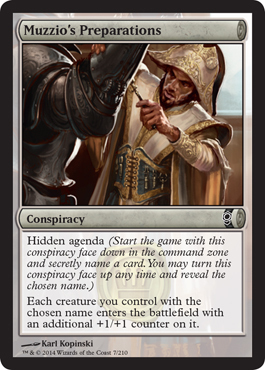 An example of cards that do weird things that can fall under this category is the conspiracy cards. These can be more difficult to understand by newer players and thus should usually be moved to uncommon. In the case of the conspiracies they actually had a conspiracy or "draft matters" card as a separate slot in the booster pack to avoid them flooding the commons and breaking the spirit of NWO. Does this card means I end up with a total net gain on cards compared to my opponent? This Red Flag is another major one after number 1 and 2 but is slightly less about design and more about developing a fun and balanced limited environment. Examples of cards that fall under this catagory are creatures with enter the battlefield effects that can destroy something on board such as Cultbrand Cinder. Be aware that cards that do straight card advantage without affecting the board such as Divination or Mind Rot don't fall under this category. 5) Does it have the potential to kill multiple card at once? Can this card be used to reasonably create on board card advantage via killing two or more cards an opponent has. This Red Flag is similar to the one above except it is more to do with how a card can be used to create advantages of how many creatures a player has. Since creatures are the core of most limited environments this is another red flag that is more to do with development than design concerns. The most obvious example of this is something like Boulderfall which can easily kill two or more creatures. Even though the card was horrible in limited due to its high cost this card would of still bee red flagged due to its potential to turn a game around more than nearly any other common. Another source of multiple kills in limited are combat tricks. If a creature you control is double blocked and you cast Giant Growth you can kill both of their creatures with a single card. However this doesn't fall under this red flag as combat tricks (and enchantment - auras) all have the inherent possibility of card disadvantage build into them if in response to your Giant Growth your creature gets targeted by a Doom Blade. However some combat tricks can affect multiple permanents and thus do fall under this red flag such as Martial Glory or Break of Day as suddenly the two creatures you blocked with can now survive thus killing two of you opponent's creature with a single common spell. 6) Can it create a loop? Does this card have the potential to create looping or repetitive gameplay? Another rarer Red Flag is that it is dangerous to have cards that can create gameplay loops by themselves at common. A gameplay loop is where an action can be repeated every turn without additional cards thus potentially not only creating card advantage but also making for an unfun enviorment for players. The main aspect that is important about these loops is that they are uninteractive which is why cipher cards are not considered as they require you to fulfill the requirements of combat damage against your opponent. The ability for cards such as Gravedigger to create a loop when played with another copy of gravedigger is why this card is now printed at uncommon. This loop creates card advantage it you block any opponent 2 toughness creatures and is very uninteractive for your opponent as even if they have removal it doesn't matter unless it exiles. However the worst offenders of this red flag are cards that create gameplay loops all by themselves such as Sprout Swarm. This card is considered a mistake by R&D and should not be at common. Be careful of your set mechanics as if you had a mechanic like Forecast or Buyback it is going to eat up a lot of your complexity by falling into this gameplay loop Red Flag. 7) Problematic in larger numbers? Does this card become abusive if I have 5+ of them in a limited deck? This is another narrow red flag rule that you should be aware of when creating cards that scale with the number of copies such as Kindle or that are free like Memnite.In a 3 pack draft you can potentially have 24 or a single common with an average of seeing 2.4 of that common. However as this is an average you don't want an above average amount of that common to ruin the draft. For example in Scars of Mirrodin playtesting originally Memnite was a common but was moved to uncommon when a play got 7-8 of them in a draft and proceeded to have ridiculous draws. The deck still wasn't even good but it creates a negative drafting experience that you don't want from your commons. 8) Does it mention uncommon magic terms? Does this card use terminology that is hard to parse for newer players? Common cards in magic form the bulk of cards seen by a newer player and are used as a learning tool when playing. However certain magic terms are not commonly used or essential to learn right away. To avoid overloading a new player on terminology certain words should be restricted to uncommon or greater or fall under this Red Flag. Non-Standard counters - eg: Briber's Purse. In the following section I'm going to show you a variety of common custom cards and you should guess which Red Flags (if any) the card is breaking. Whenever Mireburn Gnoll attacks, if you control three or more Gnolls, you may have Mireburn Gnoll deals 2 damage to target creature or player. Gnoll magic is the worst spawn of hate and blood. This card would be red flagged for a having 5 lines of rules text as well as being red flagged for its ability to potentially kill multiple creatures. Finally this also targets during combat as the opponent has not idea which creature you are going to Shock, thus making predicting combat very difficult. T: Untap up to one target Forest. You gain 1 life. "The voice of the land cries out to me. At first it cried in agony and now it cries in anger." This card doesn't break any targeting red flag as lands don't affect the board complexity at common. However the "up to one" wording is non-standard wording that has nearly never been used at common. Thus this falls under the "does it have to be read twice" Red Flag. This card could be easily fixed by changing the wording to "untap target forest" similar to Arbor Elf. Enchanted creature has "This creature gets -1/-1 for each other creature you control." Rumors spread about the court wizard and before he knew it his closest friends plotted his downfall. However the constantly changing nature of the -1/-1 effect means this can be hard to keep track of and should probably be red flagged for board complexity. T: Untap another target creature. Caravans are the lifeblood of trade on Mercalis. Each city maintaining vast guilds of drivers, horsemen and most importantly, guards. This card breaks the targeting restriction Red Flag as unlike a tapper this can mess with combat math as your opponent has no idea which card you may untap. At the beginning your upkeep, you may gain 1 life. This card doesn't break any of the text length or card advantage rules but upkeep triggers are not usually seen at common and would fall under the uncommon magic terms rule. Newer players especially forget that upkeep triggers come before you draw a card which is especially important to keep in mind. Be aware that cards like Parasitic Infestation can ignore this rule as they sacrifice themselves after a single turn, thus not maintaining the complexity over a number of turns. Target player sacrifices a creature. Target player sacrifices a land. "Dust is the legacy of the Eldrazi, and the future of this world." This card breaks card advantage and the multiple card kill rules. This is slightly offset by one of the permanents destroyed being a land but even a bad two for one can create imbalances in the commons and increase complexity of a set. Whenever an Angel enters the battlefield under your control, put a +1/+1 counter on Emeria Faithful. I see the face of Emeria not in the monsters that hunt us, but in the angels that guide us. Triggered abilities that only effect itself are not red flagged, this card doesn't make every angel you control suddenly break NWO. However this is certainly slightly more complex and can be forgotten which can lead to feel bads, thus make your triggers like this consistent like Landfall. This card doesn't break any of the red flag rules and really helps lead players towards a subtheme of the set. If players see this at common then they are going to assume you have an angel subtheme so making sure you meet that expectation is important. Landfall — Whenever a land enters the battlefield under your control, another target creature you control gets +1/+1 until end of turn. Survival is not their goal. They delay the broods so others may enjoy life a few days longer, giving meaning to their struggle. This card has 4 or more lines of text but a large portion of this is the landfall repeated ability word text. Once this is removed from our evaluation, similar to the Plated Geopede examplein this primer then this card meets all the requirements of a non-redflagged card. Note that this also targets your creatures but land drops are only at sorcery speed the vast majority of the time which makes this unable to be used as an on-board trick. Whenever you cast a noncreature spell, target creature gains haste until end of turn. The main issue with this card is that it is an uncommon. NWO red flags only applies to common cards. However even if this was an uncommon it would be red flagged for having 4 lines of text despite it being fairly simple. Note that one change would be to have an Elusive Spellfist style trigger to cut down on the total word count by not repeating the noncreature casting trigger. Trance — Target player reveals X cards from his or her hand, where X is the number of tapped creatures you control. You choose one of them and that player discards that card. Here trance is an ability word that cares about the number of tapped creatures you control which means for NWO we can disregard the "where X is the number of tapped creatures you control." text when assessing line count. Howevereven with nearly two lines of text removed this card is still too wordy, showing that you can't completely take for granted that cards with ability words won't go over the word limit for NWO. Thus this would end up red flagged. I hope this has been helpful as a guide and resource to help you understand New World Order and how to apply Red Flagging to your custom common card designs. If you have any questions/comments post them below, PM me or you can contact me on twitter at @reubencovington. I would redflag the hell out of Irridan Communer for using the "up to one target" template, one that is rare in general doubly so at common, and is known to cause awkward parsing. T: Target artifact creature gets your choice of -1/-0 or +1/+0 until end of turn. Inventory: Adventurer's Clothes, Basic Artificer Toolkit, 3 pounds of Basic metal. Very nice summary of NWO for practical use. The test is also an excellent idea. However, a few quick things on your examples. 1) MIreburn Gnoll also breaks the “affect other permanents” red flag. You bundled this aspect with the “create card advantage” flag, but they’re technically separate flags. For a test asking which flags the cards are violating, you should probably call out each flag separately in the answer. 2) Irridan Commander isn’t a great example for a card that doesn’t break red flags, as the “up to one” clause often causes people to reread the card, since it’s not intuitive that you wouldn’t want to untap a land. You don’t see Voyaging Satyr say “up to 1” when it’s untapping a land. It’s arguable, but for the example of not breaking red-flags, this shouldn’t be it. 3) Shadow of Mistrust also has the re-read problem, as the “each other creature you control” clause implies you’re playing it on one of your own creatures. This can be fixed by changing it to, “This creature gets -1/-1 for each creature you control”. Additionally, Shadow of Mistrust breaks the board complexity flag. It might as well read, "Creatures you control violate NWO". Suddenly every creature you play and every combat you get in is breaking NWO, because they're all affecting another permanent (the enchanted guy’s size). Scion of the Wild is an example of board complexity in NWO for this reason, and Shadow of Mistrust puts the reverse ability on top of an existing creature. This makes it even more complex. If the card was remade as an instant or sorcery that gave -1/-1 until end of turn – or even put a number of -1/-1 counters on the target (so you only have to check the number of creatures you have when it resolves), it would solve most of the problems. 4) Fantasy Surge is a good example of the “4 or more lines” red flag being something that can be ignored in this case (red flags exist to make you pay attention to the card and make sure it’s actually as complex as the rule suggests, though some cards like tappers are following the spirit of the law). The spell breaks 4 lines of text only because it’s following the spirit of the rule. By separating the effects onto two different lines, the card becomes easier to read rather than if there wasn’t a linebreak (which would technically let it slide past the 4-line rule). You could let this pass the 4-line rule for that reason. I’d like to see this brought up in your answer, because it’s a great point and a subtle example. 5) Caravan Sentry is a great example and a nice selection – since it at first looks like it might be fine to readers (since Gideon’s Lawkeeper and Voyaging Satyr have both been called fine, and at first glance this looks like a hybrid of those). Excellent choice. Great primer overall. It’s an extraordinarily difficult subject and even professional designers make mistakes on it all the time. I've made some changes to the answers and I'll take a look at adding more examples soon. It was our detailed conversations in my blue commons thread that really kicked off the idea to make this as a reference for future designers. Glad to help. This is going to be a great resource. Well done. I'm still trying to get a couple of questions answered on blogatog about how the text line for ability words are red flagged. 1) The link in the first example is broken. 2) Desolate needs to be read twice because it has odd templating. It lists target player twice, which is kind of nice for multiplayer games, but when thinking in duels players tend to read each line separately and it's odd to think about them targeting the same person when they're different lines of text. Seeds of Strength caused similar confusion. You might want to change the card to, "Destroy target creature. Its controller sacrifices a land." Or, "Target player sacrifices a creature and a land". That, or address the odd templating in the example. 3) Emeria's Faithful has the text "all your angels violate NWO". This might not be a problem if few angels are at common, but you should explain this more clearly. I'd disagree unless you have an angel with flash at common. Because of the sorcery speed impact of the ability in the vast majority of cases this isn't increasing board complexity that the targeting rules are design to reduce. For example a card like Satyr Grovedancer wouldn't break NWO red flagging would it? Satyr Grovedancer is a one-time effect when you cast the spell and happens while you're still looking at the satyr. One major issue of complexity is if cards affect things when you aren't looking at them. That's a major reason why a creature giving itself first strike is less complex than a creature giving another creature first strike. Since you're looking at the grovedancer when its effect triggers, it's different than if its effect were to trigger when you played another card of a certain type. Good topic. An article worth of content - and easily digestible as well. I hope this will be added to the suggested reading in the sticky. Meanwhile I'll place it in my signature. What is the status of the Ally mechanic? I might be misremembering, but I don't think it was considered a problem, and a singleton using a card type that is hardly frequent at common makes this closer to Godtracker of Jund than to anything else IMO. 20% of cards in a set are allowed to break NWO Circeus. The allies were actually a very small portion of the commons in Zendikar. I believe there were only 9 common allies in the set, and one of those had no abilities (the 2/2 artifact ally). There were even fewer in worldwake. It's also worth noting that ETB effects are much less complicated than things that sit in play and permanently up board complexity by being able to affect other permanents. Allies were further reduced in complexity by making all of the allies (except the artifact one of course) work the same way - they all had an ETB trigger and all triggered whenever another ally entered as well. In this way, each ally you played reminded you to trigger all your other allies - because it also had the "whenever [cardname] or another ally enters the battlefield" clause. It's possible that the red flag is only meant to refer to on-board complexity though, and not ETB effects. While remembering that some cards trigger when certain other conditions are met is added complexity, it might not count as "Affecting other permanents" in the spirit of NWO. In any case, it's worth keeping an eye on. I tend to see "affect other permanent" more in a "has a constant effect or easy trigger that affects other permament". That's also the difference between Wingsteed Rider and uncommons like Akroan Conscriptor or Arena AThlete. Each of the Theros set never had more than one common heroic card that affected other permanents (Wavecrash Triton, Elite Skirmisher and Bloodcrazed Hoplite, in case you were curious). I would keep tabs on this card because it's a draft around card and we want it to do that duty well, but I don't think it causes any new world order issues (unlike High Sentinels of Arashin which to me has a certain degree of NWO issues even being a rare!). Now if it said something like "Whenever an angel enters the battlefield, Soldiers you control get +1/+1 until end of turn. ", that would be a whole different kettle of fish. My point is that the ally mechanic is much more friendly based on how it's presented to complexity, and also not necessarily an example of that type of mechanic being acceptable in NWO even so. That said, I'm not sure if the flag only refers to on-board effects you can use at any time or not, and thus need to track. One-shot affect-other-permanent effects like Crackling Triton are red flagged, so sticking to the letter of the law such things are definitely suspect. However, I agree that this skirts the edge of NWO if it's even a red flag at all. But the one shot nature of Crackling Triton isn't actually that relevant, its the instant speed nature of it to mess with the board state anytime. Basically I'd treat ETB effects as not usually falling under the NWO targeting restriction due to basically acting like sorceries which use hidden information to vastely reduce the percieved board complexity as by the rules of Lenticular design the newer players don't have to think of all the possibilities of if you have an ally in your hand. However note that I would include cards like Perilious Myr under the targeting Red Flag as the death trigger often gets forgotten but is an on board thing. I'll try and get some confirmation on this on Blogatog and will consider changing the Primer slightly to reflect the answer. I think you might be missing my point. A card that you have to remember is in play, because it triggers even when you're not looking at it (especially when it's not a MAY ability, as Emeria's Faithful's trigger isn't optional), increases the amount of complexity going on. It requires players to mentally track more things, not for strategic value necessarily - but rather simply to properly follow the rules of the game. That takes up more mindspace. I'm just not sure it falls under a specific red flag. As for the focus on instant-speed, it certainly adds to complexity because you need to be thinking about the ability more often - but Crackling Triton would still violate NWO if the ability could only be used at sorcery speed. It just would be a little more managable than it currently is. -Yes, Light of Binding uses the upkeep, BUT it has a 'may' in its text. So it is a responsibility of its own player to keep himself aware of it. If he doesn't get his life point, because he simply forgot, it's his own fault and it doesn't change the game result. Also, it is a really good way to introduce new players to the upkeep, a concept which even players of three or more years are sometimes forgetting or mixing it up with the untap step. Too often I see something like 'Draw a card, Upkeep, Main Phase --> Land, Untap, Main Phase --> Creature', which shouldn't happen and I partially blame WotC for this by not printing enough cards where the order of phases and steps actually matter or are even mentionend. Nothing against you, it's just something that gets on my nerves since ages. -Emeria Faithful (or Emeria's Faithful) should in my opinion be red-flagged, since it uses the term 'angel', which isn't a game keyword like 'planeswalker' but symbolizes purity, nobility, strength and rarity probably even more than planeswalker. But that's just probably me arguing with flavour reasons. But it really helps to think about such concepts, which I only did by instinct before. Thanks. Great resource. +1 for sticky. The primary purpose of NWO is to streamline combat and make the gameplay about casting spells and attacking, not figuring out how to blow your opponent out (or how they could blow you out). The biggest problem with Lorwyn limited was that no one would attack, yet the environment was supposedly creature based. Effects which occur outside combat really don't matter for the purposes of NWO. Those type of effects exist on a higher level of play, and thus a higher level of development, than NWO is attempting to address. My Blog, currently working on series about my custom set Cazia. Steam Trades - I play Dota 2, CS:GO, TF2, and trade cards heavily. Add me if you like. I can see why it might come across that way, but that's not quite correct. It's just a byproduct of NWO, and a part of R&D's modern focus of creating gameplay they feel is fun. The primary purpose of NWO itself is to limit complexity for new players. It came out of R&D recognizing the drop of sales discovered in the Time Spiral block, while tournament attendance held steady. It seeks to address several levels of complexity, including comprehension complexity and board complexity. ... Sometimes it helps to lay out a problem when you're trying to solve it. Here's what we knew: We had to bring down the level of barrier to entry. It had simply gotten too high. The game was filled with all sorts of complexity, which was pushing it up. On the flip side, though, we had the established players. Much of what was creating the complexity stemmed from things that were important to keep our existing players. Magic has to keep adding new elements. Expansions have to have new mechanics and new keywords and new themes and new strategies. How could we possibly make all the parties happy? The solution ended up being a tool that trading card games had always had: rarity. How could we get things into the hands of the experienced players without overwhelming the less experienced players? We simply had to keep it out of common. We knew that beginning players buy fewer boosters. This means that the percentage of relevant cards they own that are common is simply much higher. Lorwyn and Morningtide, particularly Morningtide, stumbled into the issue of board complexity. Here was the problem that reared its head during Lorwyn and Morningtide. This type of complexity isn't about what cards can do but rather about how they interact with one another while they are on the battlefield. This problem was most noticeable to R&D during the employee Prerelease for Morningtide. The casual players were quitting after one or two rounds and we kept watching people who stayed in suffer as they couldn't figure out what they had to do. There was just too much dependent interaction. Another important lesson about board complexity was that it didn't take very many cards with this style of complexity to cause problems. Just one card, for example, can change the design tree from a few choices to a double-digit number of choices. Magic is a game about interactions. This type of complexity stresses that too much interaction can be just as taxing mentally as cards that take multiple readings to comprehend. As clarified in a podcast, this was due to players having to mentally track too many things at once. When you have to do that, your brain overloads. It doesn't matter where the tracking comes from, whether it's combat related or not, it's the overload that comes from mentally trying to keep track of too many different things at once. This is referred to in the article itself as "bookkeeping". Another way to think about is this: Simplifying the commons took away a lot of bookkeeping. By bookkeeping, I mean the requirement to pay attention to elements of the game that could matter but often don't. In general, bookkeeping is something you want to take out of games. Keeping track of a lot of information is actually an unfun activity, but gamers do it because they are doing their best to win. Here's a link to the article about NWO. Since the MaRo era began (Ravnica) the game has been steadily shifting towards more creature-oriented, combat-focused gameplay. NWO is a big part of that push, and is appropriately centred on combat in terms of complexity. Heroic is just as complicated as Emeria's Faithful in the example, and does not break the primary rules of NWO. I think you might be confusing the term "new world order" with thinking about modern magic card design in general. NWO has very little, if anything at all, to do with creature combat. It just limits the complexity based on rarity. However, the remaining complexity ends up being spent on things R&D thinks is the most fun. That means the overall design focuses more on combat interactions, while NWO just limits complexity based on rarity. If R&D wanted to make a set entirely based around non-interactive combo play where players almost never attacked with creatures - they could absolutely do so while still following NWO. As Maro has often said when asked if NWO is responsible for something, "If it isn't about how much complexity is at common, NWO isn't responsible for that". Yes, but my earlier point, which I still stand by, is that the majority of complexity occurs in combat. As such controlling complexity means designing for streamlined combat. Things which happen outside combat are by nature nowhere near as complex and thus their potential complexity can be higher without breaking NWO. I'm not confusing anything, I'm simply drawing the cause and effect of how NWO came to be. Things that affect combat math can add complexity. Things that don't affect combat also add complexity. NWO did not come out of a combat focus, combat is just a core part of gameplay. Storm and Eggs are two of the most complex decks to pilot, and both are non-interactive. As far as I can see, NWO has almost nothing to do with combat. In fact, Comprehension Complexity has nothing to do with board complexity - and it was the first stirrings of where NWO came from. I really don't know where you're getting this idea that combat complexity is somehow special. Complexity is complexity, wherever it comes from. Combat is often a major source of complexity, but being fertile ground for it has little to do with the red flags of NWO. That's a reason why no Red Flags mention combat at all, and why the article about NWO doesn't mention it starting from a combat focus. Maybe I've missed something in the articles though. Can you provide a quote?